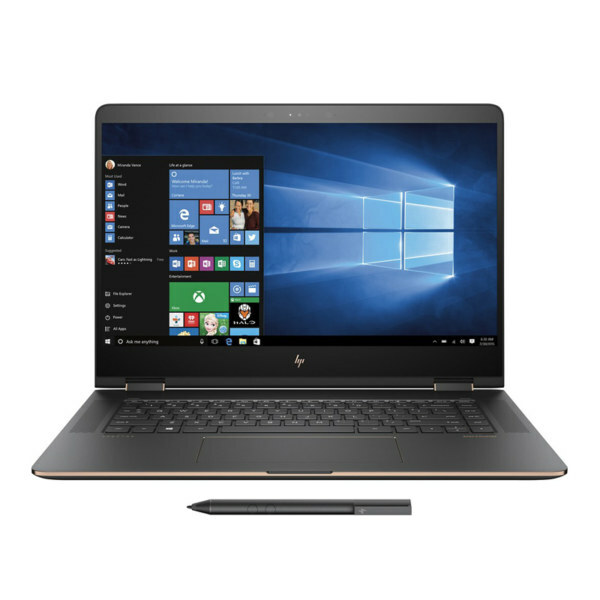 Enjoy flexible computing at work and at play with this HP Spectre x360 notebook. Specially engineered to rotate around a 360-degree metal hinge, the display on this laptop folds back upon itself to create a handy tablet in seconds. The HP Spectre x360 notebook’s 4K high-definition display delivers stunning graphics and with Windows Ink compatibility, making the machine ideal for designers and movie lovers alike. Enjoy Ink driven experiences in apps like Office, Messenger, and Microsoft Edge, as well as apps from brands like Adobe. Windows Ink is integrated with Illustrator to bring you an intuitive pen experience. 3840 x 2160 resolution offers impressive color and clarity. The dual-core, four-way processing provides maximum high-efficiency power to go. Intel Turbo Boost Technology delivers dynamic extra power when you need it. Reams of high-bandwidth DDR4 RAM allow you to smoothly run your graphics-heavy PC games and video-editing applications, as well as numerous programs and browser tabs all at once. Enables versatile use as a tablet or a laptop, as well as easy hands-free viewing. Driven by 2 GB of dedicated video memory to quickly render high-quality images for videos and games. Bang & Olufsen audio produces high-quality sound. Features ultra-portable design with a smaller screen size and no DVD/CD drive to achieve compact form factor. Wirelessly transfer photos, music and other media between the laptop and your Bluetooth-enabled cell phone or MP3 player, or connect wireless accessories. USB 3.1 ports are backward-compatible with USB 2.0 devices (at 2.0 speeds). Connect to an HDTV or high-definition monitor to set up two screens side by side or just see more of the big picture. This single interface supports both high-speed data and high-definition video — ideal for digital content creators. High-speed wireless LAN is built into the screen, so it connects to your network or hotspots on the most common Wi-Fi standards in both laptop and tablet modes. Features an Island-style keyboard with chiclet keys and a touchpad supporting multitouch gestures.